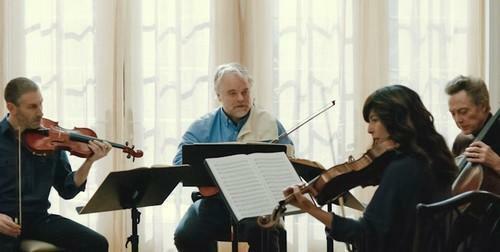 THE HEDONIST JIVE: "A LATE QUARTET"
"A LATE QUARTET" is a unassumingly good, not quite great film with a few big indie-to-mainstream names in it that comes together quite well. It's got some low-level pathos, some romantic entanglements, some highbrow bickering and bantering, and a pleasing backdrop of cultured, snowy Manhattan in winter. Director Yaron Zilberman made this, his first non-documentary feature, in 2012, and he brought together two of my favorites, Catherine Keener & Philip Seymour Hoffman, in lead roles, along with the previously unknown-to-me Mark Ivanir and the all-too-well-known Christopher Walken. They're a celebrated classical string quartet celebrating their 25th anniversary, just as everything that's kept them going begins to fall apart at once. Surprisingly, it's Walken who delivers the A-level performance, as the quartet's founder and leader who decides to leave the group once he discovers that Parkinson's disease is slowly compromising his ability to play at an elite level. The "Fugue Quartet" has been coasting along on their talent and reputation for 25 years, booking shows around the globe and garnering the covers of all the sorts of publications that still cover classical music. It has sustained and defined each of them, but when Walken's Peter Mitchell announces his ailment and desire to leave, it sends the other two men into egotistical flights of existential crisis. Hoffman's character decides he doesn't want to always play "second violin" to Ivanir's "first violin", and his wife and quartet-mate, Keener, doesn't quite support his gusto to change seats in middle age. So Hoffman impulsively cheats on her like a big dope with a young Salma Hayak lookalike named Pilar, played by Liraz Charhi (who it turns out is Israeli in real life). Meanwhile, Ivanir's character Daniel starts secretly courting and then sleeping with Hoffman & Keener's daughter, whom he's been trying to teach violin and who's much more interested in flirting with him than actually learning. The actress that plays her (Alexandra), with the awesome real-life name of Imogen Poots, is both extremely radiant & compelling and totally off-putting, with her ham-handed lines clunking in the midst of so much great acting talent around her. Let's blame the writers on this one, as well as her not-so-great ability at covering up her own British accent with an American/New York one. So things get ugly, then uglier - secrets are spilled, truths are told - and then things get better again. It's Walken who's the revelation in this. He's become so cartoonish in recent years, I guess I forgot that he can act forcefully in this quiet, unhurried, mature style. He's great. I might not remember a thing about "A LATE QUARTET" a year from now, but today in April 2013, I'll give it the old rental thumbs-up for ya.